In some small circles it is becoming an alarming trend in ISKCON to subtly minimize our beloved spiritual master. This is very dangerous because our real advancement in devotional service is a direct result of our having full faith in both Srila Prabhupada and Lord Krsna. They say that this explicit faith in the bona fide guru is absolutely required. “To anyone who has full faith in the Supreme Personality of Godhead and the spiritual master, all the imports of the Vedic literatures are revealed. 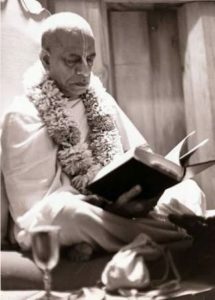 He does not have to seek separately.” So as faithful disciples of Srila Prabhupada, we see our beloved guru like that. He is as good as Krsna because he is the most confidential servant of Krsna. We know that when such a great soul takes complete shelter of Krsna that Krsna protects him in all circumstances. We also know that Krsna is fully manifesting Himself through him, empowering him in all aspects of his life. He has no life except Krsna. He has no opinion that is different from Krsna’s opinion, and whatever he is doing in all of his activities, Krsna is doing through him, because he has surrendered cent percent. Like the example of the iron in fire, the iron takes on the qualities of fire. Because Srila Prabhupada has taken complete shelter of Krsna, he has become as good as Krsna. The material energy no longer exists in the form of such a maha bhagavata because Krsna is manifesting through such a surrendered soul. The material modes of ignorance and passion have completely disappeared.